What is the National Childcare Scheme? The National Childcare Scheme is our pathway to truly accessible, affordable, quality childcare. From October 2019 it will replace all previous targeted childcare programmes with a single, streamlined and user-friendly Scheme to help parents meet the cost of quality childcare. Supports are available for families with children aged between 24 weeks and 15 years who are attending any participating Tusla registered childcare service, including any Tusla registered childminder. Universal Subsidies are available to all families with children under three years old. They are also available to families with children over three years who have not yet qualified for the free preschool programme (ECCE). This subsidy is not means tested and provides 50c per hour towards the cost of a registered childcare place for up to a maximum of 40 hours per week. Income Assessed Subsidies are available to families with children aged between 24 weeks and 15 years. This subsidy is means tested and will be calculated based on your individual circumstances. Your rate will vary depending on your level of family income, your child’s age and educational stage, and the number of children in your family. The subsidy can be used towards the cost of a registered childcare place for up to a maximum of 40 hours if you are working, studying or training, or in circumstances where you are unavailable for childcare, and a maximum of 15 hours if you are not working, studying or training. For more information on Universal and Income Assessed subsidies click here. To see the National Childcare Scheme Information Leaflet and Frequently Asked Questions click here. 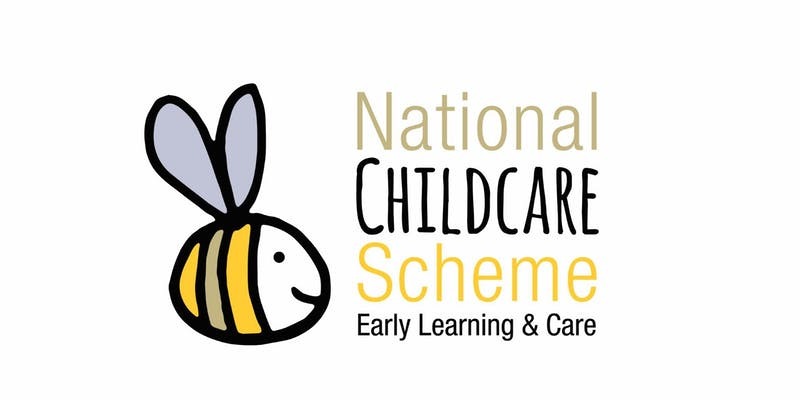 Applications for the National Childcare Scheme are due to open in October 2019. To apply for the Scheme online you will need to have a verified MyGovID. Your verified MyGovID is your single, secure account to unlock Irish Government services online. Click here to set up your verified MyGovID before you apply.